The disaster continues, but some have found a way back to their families despite the ravaged region's floods. NBC's Leanne Gregg reports. Scores of Colorado school kids and their adult chaperons who were stranded at an outdoor education center near Boulder were rescued by helicopter and returned safely to their families on Saturday, a Boulder Valley School District spokesman told NBC News. The young students from Fireside Elementary School in Louisville, Colo. – about 10 miles southeast of Boulder – were caught at an outdoor education center in Jamestown when floodwaters made roads unsafe, school district officials told local newspaper the Daily Camera. "All the kids are down from the mountains and either delivered here or en route," said Briggs Gamblin, a spokesman for the Boulder Valley School District. The 85 fifth-graders and 14 adults who were with them were plucked from the mountainside by helicopter, then flown to the Boulder Municipal Airport before being loaded onto buses and brought to Fireside Elementary, Gamblin told NBC News on Saturday. Colorado's flooding has left hundreds unaccounted for and there's no respite from the rain insight until next week. NBC's Joe Fryer reports. The kids had been stuck at the Cal-Wood Education Center, which provides outdoor programs, according to its website. The center kept parents updated on the status of their children on its website, writing on Friday that the students ate "hard tacos with all of the fixings for dinner" and had a dance party – even as officials figured out how to get them home. "We have a lot of cheering parents," Gamblin said. A spokesman for the Army installation that sent the choppers said they were "overjoyed" by the successful rescue. "Last night around 5 o'clock we got a request from the National Guard for assistance," said Maj. Earl Brown, deputy public affairs officer for the 4th Infantry Division at Fort Carson. They sent a total of seven helicopters, including four Blackhawks, to assist in lifting the kids and their chaperons out of the area. "We're just a part of a whole team effort to help those folks out there in Boulder County," Brown said, adding that the same helicopter brigade helped in the effort to put out Colorado wildfires in June. "We went from drought to deluge," he said. There are still scores of people unaccounted for after the devastating floods, authorities said, but they are not officially considered missing. At a YMCA in Boulder that has served as a refuge for some, spokeswoman Andra Coberly said about 60 people stayed overnight, and they have received calls from family members or friends looking for loved ones. "People are like, 'What now? How do we move on from here?'" Coberly said. The Colorado National Guard has rescued 120 people since the flooding started, state DPS public information officer Micki Trost told NBC News, and would continue to help in rescue and recovery efforts as local authorities request them. Authorities are still worried that the water may rush into more communities as it flows downhill, Overstreet said. At a news conference Saturday, Sen. Michael Bennet, D-Colo., said: “It kind of feels like Colorado can’t get a break,” referring to the deadly floods coming up on the heels of devastating wildfires earlier this summer. Boulder County Sheriff Joe Pelle says that the sheriff's department is working hard to narrow the list of "unaccounted for" people in the devastating flooding that hit the state. "The destruction is something I could never have imagined,” Rep. Ed Perlmutter, D-Colo., said about the floods' aftermath, adding that he got “goose bumps” watching citizens being rescued. The Federal Emergency Management Agency announced Saturday that it continued to track flooding in Colorado, and the Boulder Office of Emergency Management warned residents on its Twitter feed not to drive through water, as roads were washed out in some areas. At least four people are thought to have died as a result of the floodwaters that swept through the Boulder area after days of rain, covering an area almost as large as the state of Connecticut, according to Weather.com. "We are assuming there may be further loss of life and injuries," Boulder County Sheriff Joe Pelle said on Saturday. "Given the devastation on some of those canyons, it's definitely a high probability." Yet there were also stories of perseverance and survival that emerged. "We rescued a young couple yesterday from Lyons," Pelle said Saturday. "The young lady is pregnant and her due date is tomorrow." 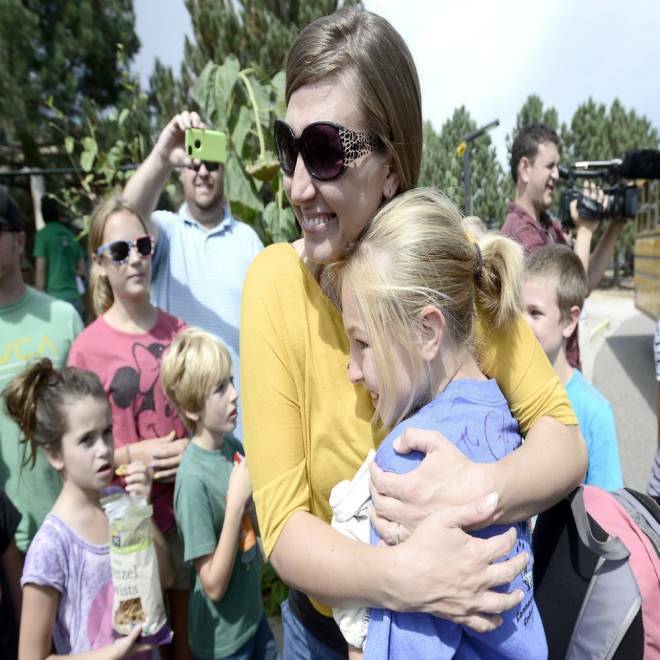 Bonnie Dannelly hugs her daughter Makayla Dannelly after she got off the bus at Fireside Elementary in Louisville, Colorado September 14, 2013. Makayla Dannelly was one of over 80 Fireside 5th graders who were trapped above Jamestown at Camp Cal-Wood. NBC News' Tracy Connor and Miguel Almaguer contributed to this report. Reuters and the Associated Press also contributed.